Recent research by MarketplacePulse made us focus on Walmart role in jewelry eCommerce ecosystem. According to the research, jewelry makes about 6.5% of Walmart products catalog. There are above 2.5M products in Jewelry department. This means that the category is quite significant on the marketplace. Not all marketplaces have enough volume in the jewelry category, allowing them to focus on the industry needs. 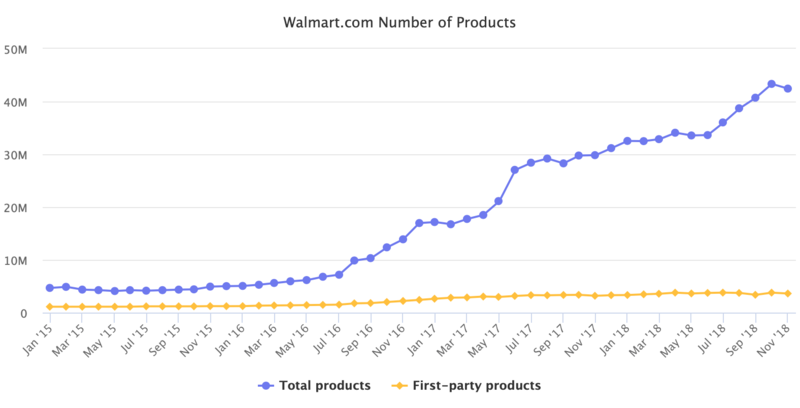 Walmart is actively growing, while encouraging external sellers to join. Only 2% of jewelry is sold by Walmart itself (one of the lowest rates in the marketplace). This is an opposite to Amazon, which has a very self-oriented strategy. It was shown not once, that Amazon’s brands have lower success than ones of 3rd-party sellers, and in the long-term point of view the strategy of ecological co-existence between the marketplace owned products and 3-rd party sellers is more effective. Accepting only US companies as marketplace sellers, Walmart creates very strong protection for US sellers and is not too crowded (only 20K sellers). This is very much different from eBay and Amazon, crowded with more low-cost international sellers. From our clients’ experience we know that the marketplace performs well also in expensive products in the $3000-$4000 price range. Buyers consider Walmart to be a provider of high quality products. This positioning allows selling high-quality jewelry, and has a positive role for the brand. In today’s cross-channel marketing world, this is an important factor in selecting the marketplace to sell jewelry. While having relatively small catalog comparing to Amazon, Walmart offers over half of Amazon’s best-selling products. This means the quality standards are high and allow the high-quality jewelry be relevant for the marketplace. Our resume: Walmart is one of the top-5 established players in the US eCommerce market. For new sellers, it’s not easy to get into, but worth the effort. We put Walmart in focus, expecting for further growth and success of this marketplace in jewelry category. WEBINAR: Are you ready to sell jewelry online seriously?